Nivy is a Hindu. She loves Aussie rules football. And her goal is helping others. When she was growing up in the Middle East, Nivy experienced firsthand how religious identity shaped the way people related to one another. Recovering in the hospital after a serious accident, Nivy’s background as an Indian Hindu all of a sudden became an issue, and had she not also been an Australian citizen it is likely her treatment would have been jeopardized. Now, years on, this experience of prejudice remains with her as a vivid memory. Nivy is a young person in an era of inter-religious conflict, and in understanding just what is at stake she is working to build global interfaith cooperation. She is part of a movement of religiously motivated young people who (although their individual stories are unique) share a common vision. Nivy is just one of the young leaders helping to build InterAction, a multifaith youth network based here in Australia. InterAction has a mission of fostering mutually enriching relationships and respect for identity by engaging young people in common action for the common good. We are inspired youth from diverse cultural, spiritual and religious backgrounds, working together side-by-side to build a better world. Through collaborative service projects, InterAction links like-minded groups and individuals to make positive contributions to their local communities and humanity as a whole. By doing so, we aim to replace conflict and competition with cultures of co-operation and peace. We subscribe to the model of action-focused interfaith engagement. Not everyone can be an expert in theology, but each person already is the expert of their own experience. In building inter-religious harmony, the doorway to dialogue is action. By collaborating on service projects which tackle issues of common concern, we can truly come to recognize one another as allies and friends. In this way, not only can people of different faiths share the one table, we can each enjoy our different dishes and come away feeling mutually nourished and enriched by the experience. InterAction is interested in fanning the flames of a social movement. As Eboo Patel (founder of the Interfaith Youth Core) says, movements happen when people feel so inspired to hear the music playing that they go out and start their own band. We’ve started a band here in Melbourne, and we want to see others do the same – across the country, and beyond. Why? Because the fact of diversity is not enough. We need to engage it towards positive ends. 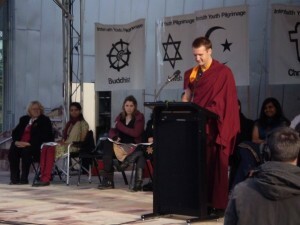 The Parliament of World’s Religions came to our city last December. Among the sea of people working for interfaith cooperation across the world, you might have missed us, but we were there. One afternoon, in room 210, Nivy got up and told her story. At her side were her friends; six young people from six different faiths with six different stories – all sharing a common vision. The feeling in the room was electric. Our band was playing. The interfaith youth movement had arrived Down Under. Originally published by the Journal of Interreligious Dialogue, July 21, 2010. Ven. Freeman Trebilcock (Thubten Gyaltsen) was ordained at the age of 12 at Chenrezig Institute, by Lama Zopa Rinpoche. Now 22, he is a founding member of Loving Kindness Peaceful Youth. Freeman has been actively engaged in interfaith work for the past three years with InterAction multifaith youth network, promoting daily interfaith cooperation through common action for the common good.